How do you accurately measure Marketing Success? For many professionals, this question is difficult to answer; there is a lot of data out there for you to collect, but doing something useful and meaningful with it presents a great challenge. That’s where dashboard software comes in. Using Dashboard software, you can use different kinds of data to improve the way you implement your marketing activities. 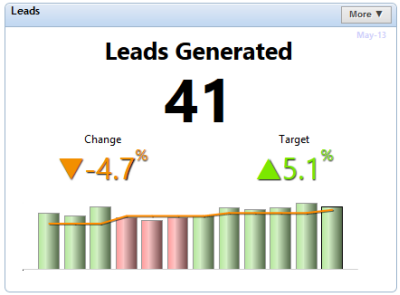 In this article, I will be showing you an example of a dashboard that shows marketing KPIs. I will then break it down for you to see how each chart gives users the information they need to improve their marketing. The tricky part of measuring marketing effectiveness is that it’s very difficult to attribute success to a single activity or campaign. Even if you collect all sales, conversion and lead data, it’s not like you can immediately see what’s working and what’s not, right? The main purpose here is to gauge the overall effectiveness of your marketing budget. By comparing whether your spend and lead targets are met each month, you can adjust your spend (and by proxy your strategy) to be more cost-effective. Color coding each value lets you immediately compare spend and lead generation at a glance, saving time and effort for busy executives. If you need to compare any point in time, this is the place. This centerpiece of the dashboard complements many of the other items, as it displays what is perhaps the most important part of marketing activity (besides profit of course!). The Digital Gauge lets viewers easily compare the other charts in the dashboard to this lead data, giving it some context. The main advantage in using a gauge is that it emphasizes what is happening right now for this important KPI. This is particularly useful for our marketing dashboard, as we can glance at it and see exactly what we need to know about our current situation. Again, the information in this chart is colored by status. The change in number of leads from the previous month is particularly important, as this value can be the first indicator that a change in your marketing campaigns has worked, or perhaps not worked. This graph gives us the same information as the Digital gauge in the middle of the dashboard, but offers the ability to change the timescale of the chart. By using the dropdown menus at the top left of the chart, you can display the data as quarterly or annually. This can uncover trends which were previously hidden by the monthly timescale. The area graph complements the colored status information from the digital gauge, giving users many different options for viewing the same data. Note: The main reason this chart is an area chart is that we want to see directional information , not value differences (we’ve already got this covered in the bar chart on the digital gauge). 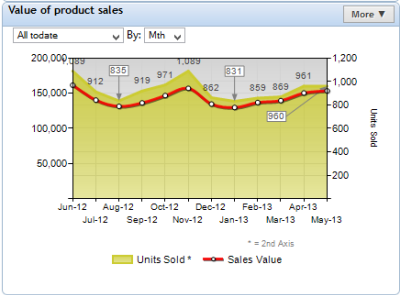 If you’re using dashboard software like Target Dashboard, changing this chart to a column chart takes only seconds. 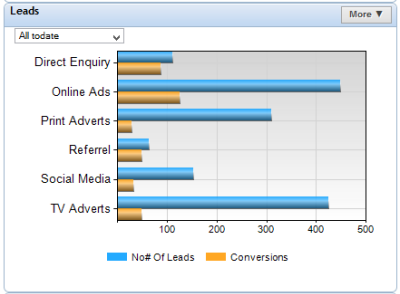 Here, we have a chart which divides our leads by each of the marketing channels currently used in our campaign, and compares them to the number of conversions from that campaign. I have displayed this information in bars instead of columns because the labels for lead types are easier to read at the left of the page. ii. We can easily compare the difference of conversions to leads for each channel; this lets us decide which campaigns are worth more of your budget, and which need reviewing. Displaying a Conversion percentage would be easy too. However, this chart becomes essential when compared to the next and final chart in our dashboard, as you will see. It can be very difficult to measure marketing success. In particular, it is difficult to determine return-on-investment (ROI) with your marketing campaigns. This chart, taken from sales, lets us get one step closer to determining marketing ROI. Here, we have both the monetary value of our sales for the past 12 months, as well as the number of units sold. Both of these are important KPIs, as neither of them by themselves is enough to see the true success of your company. Note: As you may have noticed, the units sold is obviously a lot lower than the value of sales, which is why it is displayed on the Y-axis to the right of the chart. Notice how this chart and the lead channels chart are side by side at the bottom of the dashboard. The main reason is so that we can compare these charts easily, to see how each one changes as time goes on. If we want, we could change the layout of the dashboard to accommodate these charts at the top. 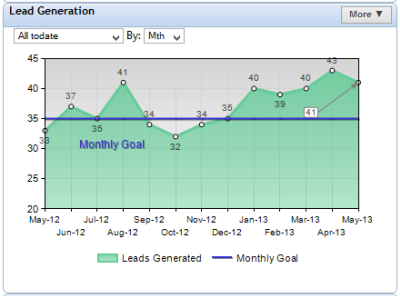 Using a KPI dashboard, you can quickly spot trends in your data to take action quickly. This way, you can improve your marketing by having a better idea of what is working and what isn’t. To reiterate, marketing has never been an exact science. There are often things that are hard to control which affect success, but by visualizing your data in a dashboard, you can see how the numbers change according to what campaigns you’re running, making it easier to make changes. This dashboard isn’t intended to be a template for your own KPIs (it is always better to create something which suits your data), but rather an example of the kind of thing you can achieve with dashboard software. 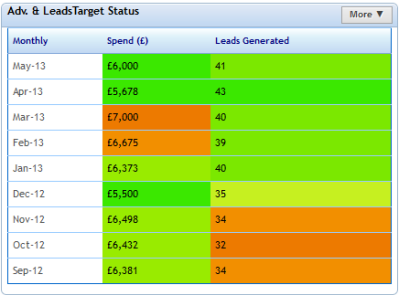 To try out these ideas for yourself, why not try a free demonstration tour of Target Dashboard? And if you need some help, just download our dashboard best practice guide for free!